Which management plugin is the better alternative for my blog? With more and more competing premium WordPress plugins it gets harder and harder to answer that question. This article takes a look at two popular plugins to manage multiple WordPress sites: It compares ManageWP with InfiniteWP in order to help you with your decision in choosing one. There are several other alternatives to ManageWP and InfiniteWP on the market which I have compared in separate articles. Go to my main WordPress Management Software comparison to start your search. Please note that this comparison only looks at the features on paper as reported by either plugin’s developers. It does not and can not tell you if or how well a certain feature will work for you. 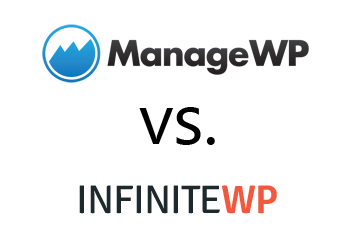 Because such a verdict would depend on too many variables, including your server setup and personal preference, I have decided to stick to the hard facts for this feature comparison between ManageWP and InfiniteWP. In my comparison I track 35 different features for all the WordPress management plugins. In ManageWP you can find 32 out of 35 of those features. InfiniteWP on the other hand offers 27 out of the 35 features in total. 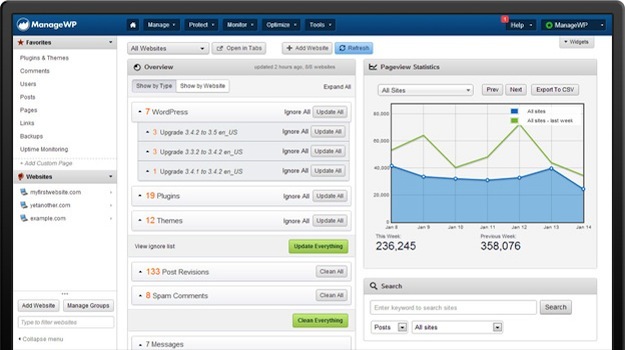 Even if many of the features compared above overlap between those competing products there is one very important difference: ManageWP as well as InfiniteWP both provide a unique interface and dashboard from which you will manage all your WordPress blogs (pictured below). Since it is hard to rate the quality of such an interface objectively I recommend that you try both products yourself by signing up for the free trial offered by either service. WPscoop indexes the exact prixing plans of all compared plugins. Please refer to the table below for a quick overview of the prices of ManageWP and InfiniteWP. To find the cheaper management plugin for your individual needs please go to my main comparison article. There you can search for the features you need and then see the exact price you would need to pay for ManageWP or InfiniteWP (as well as other alternatives). Most WordPress plugins have an option to test their service for free, either thrhough a basic free version, a trial period or online demo. Check if such an offer exists for ManageWP and InfiniteWP and if so: Make use of it! By doing so you can compare both plugins directly and find out which one is the better alternative in you situation. But wait, there is more! Besides ManageWP and InfiniteWP I have compared several other WordPress management plugins on WPscoop. I recommend you start your search for ManageWP alternatives or InfiniteWP alternatives in the main comparison article. There you can filter all different products and search for the features you need. Which one is the better blog management service: ManageWP or InfiniteWP? Please share your opinion or experience in the comments! InfiniteWP has only $399 for one year (all addons) and renewal charge for next year $199. The maximum price for InfiniteWP does also factor in the Enterprise Edition which is sold separately and not included in the addon package. I’m using ManageWP, and it is just an OK for me. It doesn’t handle multisite extremely well and I have regularly failed backups. Support is S L O W.
The business plan just gives me a very very basic SEO list of keywords, and site uptime, and white labelling so its not worth upgrading to this plan. You can get all these tools free elsewhere in a specific SEO plan for all your sites. Think I have come to the end of the road with ManageWP so will try some of the others. Also if you have big sites the backups won’t work. I have one that the backup is 2.6Gb and the only one that backups this successfully each day is my host WPEngine. I find it strange in your price comparison chart you only evaluate costs for 1 site and 10 sites. The whole point of self-hosting IWP is it’s a flat fixed cost structure. It would be great to add costs for 100 sites in MWP and IWP. Although one should also add into that ~$10/m for self hosting IWP. Please have a look at my main WordPress manager plugin comparison. There you can compare prices for more than 10 sites as well. I have tried both and for what I am doing InfiniteWP works great. I really just like the basics with what I am doing. ManageWP is great as well but I don’t need to spend money with InfiniteWP and basically get the same features for what I am using it for. So if you need more options, spend a few bucks and go with ManageWP but if you are sticking with the basics InfiniteWP is great! Thanks for this. I have been thinking about dumping ManageWP for a while. Its a great system for WordPress developers like is, but I’ve never been very fond of SAAS based stuff. Going to try Infinite WP see how it goes. Thanks again for your most excellent review. Saved me a lot of time. Thanks, I am glad you found the comparison useful Christopher! 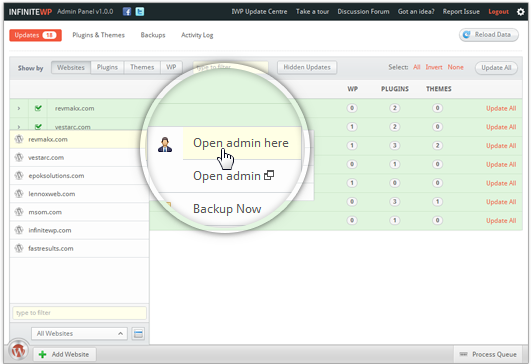 Infinite WP has backup to google drive option . Thanks, seems they added Google Drive backups since I created the comparison. Added now. Thanks for this comparison, it’s exactly what I was looking for: a breakdown of each by feature. Glad you find the comparison useful!